Paraoptometrics are a valuable part of health care teams. Paraoptometrics who have the Paraoptometric Career Studies Certificate can generally expect to have more job opportunities. Program graduates will also have better pay available to them. The CPO certification is the first step to achieving several other certifications. These additional certifications can be obtained by working with an optometrist. 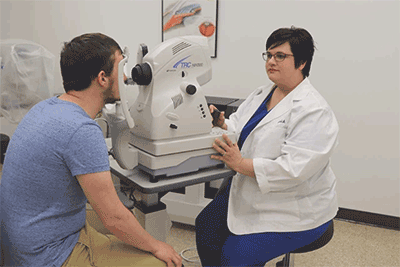 If you already work in an optometry office the certificate will prepare you for the AOA (American Optometric Association) Certified Paraoptometric (CPO) exam. If this is a new career or a change in career, the certificate will provide an understanding of optometric principles and knowledge of instrumentation, anatomy, optics, basic pharmacology and aspects of practice management for employment in an optometrist’s office, which is needed for the CPO exam. We are taking applicants for Fall 2018. Please contact Georgia Householder at georgia.householder@sw.edu for information. The program is offered in 2 semesters through online coursework with lab one Saturday a month on campus. See the OPT courses taught this fall on the class schedule (type OPT in the schedule search box). Annual income will vary greatly depending on the size, type and location of the practice in which you are employed.